I absolutely love the new wizards from Whimsy Stamps. 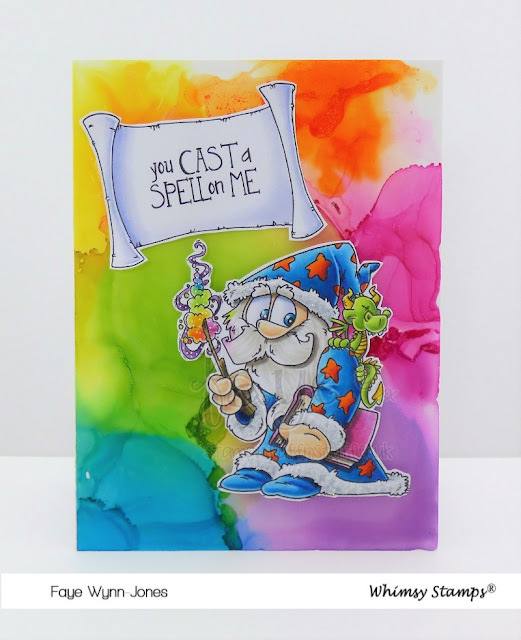 This chap is from the Cast a Spell Set and I thought he would go perfectly on a messy, inky background. You might have noticed I've been trying these out a little lately, as I have some Transotype Synthetic Paper to play with. Happy Days! The little wizard is so adorable. I love the bright background. Great card Faye. The question is what the heck is this paper and do I really need any. It's a lovely background. Hugs Mucer.